Border Gateway Protocol (BGP) is the protocol which is used to make core routing decisions on the Internet; it involves a table of IP networks or “prefixes” which designate network reachability among autonomous systems (AS). BGP is a path vector protocol or a variant of a Distance-vector routing protocol. BGP does not involve traditional Interior Gateway Protocol (IGP) metrics, but routing decisions are made based on path, network policies and or rule-sets. For this reason, it is more appropriately termed a reachability protocol rather than routing protocol. Configure Loopback interfaces with ip address and mask as shown in network diagram. Configure FastEthernet interfaces with ip address and mask as shown in network diagram. Configure Serial interfaces with ip address and mask as shown in network diagram. Enable BGP on R1, R2, and R3 as shown in the network diagram. Advertise connected networks for all routers. Save configurations on all routers. Check BGP neighbor relationship on R3. Check BGP summary information on R2. Check routing table on R3. Using ping verify that all networks are reachable from R1 and R3. 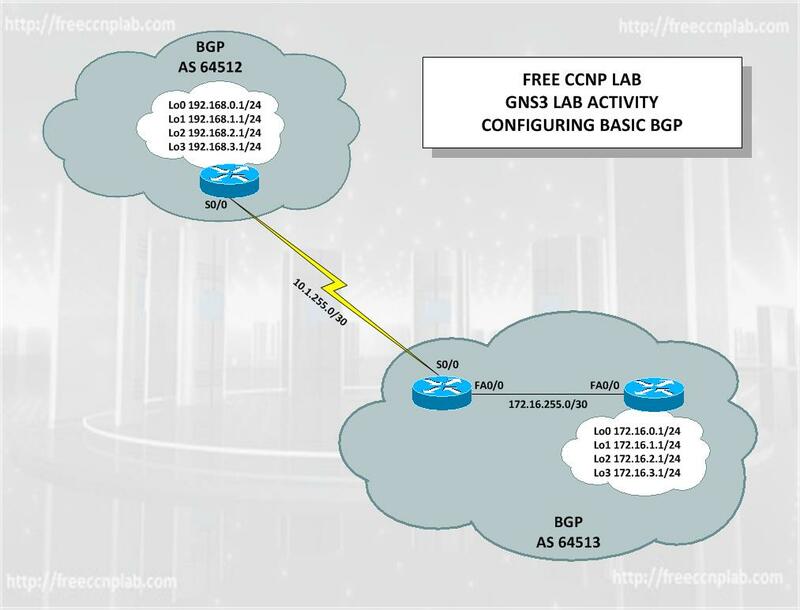 This complete this Free CCNP Lab. Your solution file contains one subnet on R2 router bgp 64513 neighbor incorrect ip.